Summer 2019 will be here before you can say "Ski ya Later" and Ski Masters is already gearing up for the best summer ever! Most of our "old hands" know our procedures and sign up early to insure availability. If you are new to our program, give us a call at (830) 557-5711 for more details on our 2019 schedule. Julie and Don are ready to answer your questions and mail you all our current information; including day camp opportunities. 2019 Dates are posted in the Events link on the left and also under More Information. wait as 2019 is already shaping up to be another Great Season at Ski Masters. offering one of the finest facilities of its kind in Texas. Founded in 1995, our facility is located on the shores of beautiful Lake McQueeney. Owned and operated by Don and Julie, Ski Masters provides instruction at all levels for the skiing enthusiast. "Best Little Ski School in Texas." Basic to our philosophy is remembering that skiing is a sport that tests character. our campers through effective teaching, goal setting, and personal challenges. At Ski Masters, we work as a team while stressing individual goals. leadership, sportsman or "ladyship", courtesy and dependability. A good way to visit Ski Masters is to get your own group of friends or family together. and plan to return at the same time the following year. Officially, our weekly sessions begin the first week of June with the final week ending in August. Our campers arrive on Sunday no earlier than 5:00 p.m. and leave Friday after our awards ceremony at noon. 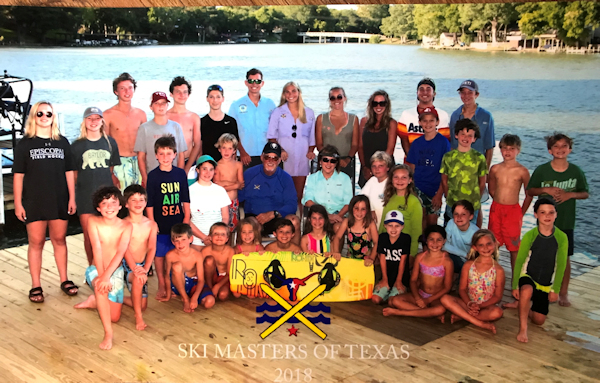 Ski Masters also offers daily or weekend day camps and Private Ski Instruction with Don in the spring and fall prior to and after our regular summer camp. on shore while our skiing instructors stress safety and proper boatmanship. We make sure each student receives the personal attention he or she deserves. All supervision is done in a cooperative, respectful manner. because that is the final day at Ski Masters for our guests. Parents should arrive at 10:45 and stay for the awards ceremony at 11 :00 a.m. The Lake Breeze Ski Lodge is located just minutes from Ski Masters. The Lodge provides the ideal place to stay, eat, drink and relax. Plan to stay the night or the whole week while your kids are at camp. call us at (830) 557-5711 and we will reserve your Ski Masters experience for you. Space is extremely limited and once we are full, we can no longer accept students. Upon receipt of your non-refundable deposit, we will send you additional information and what you should bring to Ski Masters. Skiing...the reason for the season!